Porous silicon is rapidly attracting increasing interest from various fields, including optoelectronics, microelectronics, photonics, medicine, sensor and energy technologies, chemistry, and biosensing. This nanostructured and biodegradable material has a range of unique properties that make it ideal for many applications. 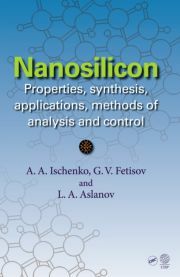 This book, the third of a three-volume set covering all aspects of porous silicon formation and applications, focuses on applications of porous silicon in optoelectronics, microelectronics, and energy technologies. 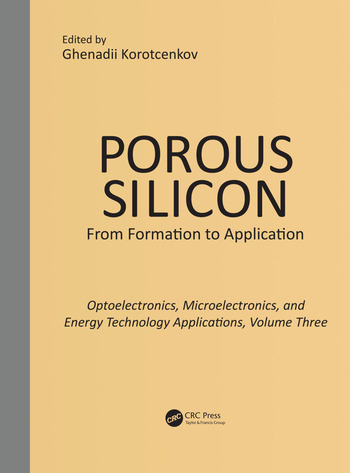 Porous Silicon: From Formation to Applications: Optoelectronics, Microelectronics, and Energy Technology Applications, Volume Three is an indispensable resource for scientists and engineers in industries and laboratories. It provides an updated, comprehensive, single source of information that was previously scattered across numerous journal articles. It contains a wealth of insights for designing and improving the performance of various porous silicon-based devices, and is also a significant reference for those interested in learning more about the unusual properties of porous materials and possible areas for their application. Dr. Ghenadii Korotcenkov is a research professor in the School of Material Science and Engineering at Gwangju Institute of Science and Technology in South Korea. He earned his PhD in physics and technology of semiconductor materials and devices from the Technical University of Moldova, and his Dr. Sci. degree in the physics of semiconductors and dielectrics from the Academy of Science in Moldova. He has more than 40 years of experience as a teacher and scientific researcher, and has been involved with numerous national and international scientific and engineering projects. He is the author or editor of 29 books and special issues, holds 18 patents, has published more than 200 peer-reviewed articles, has presented more than 200 reports at national and international conferences, and has received several awards and honors.